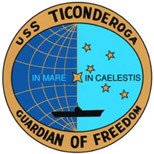 We are US Navy veterans of the aircraft carrier USS Ticonderoga (CV/CVA/CVS 14) which served our country from 1944-1975, and the Aegis Cruiser USS Ticonderoga (CG 47) which served from 1982-2004. As proud sailors, we have established this veterans association to maintain our relationships together, to create new connections through reunions and sharing, and to promote the Ticonderoga legacy. If you have ever served on one of the Ticos, then please join us. We'd love to re-connect with you! One of the great things about our association is that we hold a reunion at a different place each year around the country. THIS year we held our reunion in New Orleans, Louisana. To learn more about joining us at our 2019 Reunion in Albuquerque, New Mexico click on the reunions page for more info. Another great thing about our association is our quarterly newsletter which keeps us abreast of all the latest Tico news and allows us vets share our experiences with each other. Feel free to print or download our latest newsletter from our NewsLetter Page! 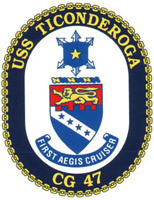 A NEW USS TICONDEROGA SHIP! SUPPORT THE MISSISSIPPI MARITIME MUSEUM! You can support the effort by becoming a member of the MMM or just making a donation to them. Details are below. As with any project, the faster they get funding the faster they can start the project. Please ask family and friends for their support and also any businesses you feel would be interested. We all look forward to seeing MMM open and USS TICONDEROGA, CG-47 material on display there. Click Here to print or download membership form. WHERE ARE THE SHIPS BELLS! CLICK HERE!